We partnered with Staybridge Suites on the post below. While sponsored, all opinions are our own. Seattle, Washington is a well-known vacation destination for families, and for good reason! But venture just a bit further north and parents will find a wonderful outdoor playground in Mukilteo, north of the city near Everett, Washington and Whidbey Island. This past June, we were able to spend several nights in this area, as we were en route to Whidbey Island. Mukilteo wasn’t our final destination during this trip, but we found lots to do here and in Everett with our kids. That was a happy surprise! As we often do during road trips, we looked for a hotel with plenty of space to spread out plus a complimentary breakfast or kitchenette to make our own. With three kids (two of whom are teens); we highly value the ability to make meals in our suite. We found a Staybridge Suites hotel that fit the bill – Staybridge Suites Seattle North-Everett – and we were even able to use our IHG points to book during this popular tourist time. It’s perfect if the weather turns on you, as it often does in this part of Northern Washington. The Imagine Children’s Museum in Everett includes two floors of hands-on learning in science, movement, art and theater. Kids can step into a bus, farm or store. Located in Mukilteo, Harborview Park allows kids to get a real feel for where they are located by being able to see the Puget Sound! The ocean vistas are lovely on clear summer days, and it’s possible to see the ferry coming and going, which builds excitement for a trip to the island. It’s likely you’ll see military ships passing along Possession Sound here as well, which was fun for our teens. To get to adjacent Whidbey Island, families take the Clinton ferry (ferry terminal is easily located right in Mukilteo). This ferry ride takes less than an hour and it’s easy to bring a car onboard (recommended for Whidbey Island touring). Be sure to get a ferry reservation during the summer months. Coupeville is my favorite Whidbey Island town because of its historical nature and lack of suburban sprawl. It tends to be less crowded, too. When we visit, we like to head to the pier and check out the quaint stores along the water. There’s a great toy store and book store there. Families can take a free farm tour from Coupeville, following a self-guided farm trail that takes them to lavender farms and organic beef cattle ranches. There are multiple state parks on this relatively small island. Our favorites include Deception Pass, where you can take a jet boat ride under the bridge to the sea lion habitats (we even saw dolphins). At Fort Casey State Park, the kids can climb on old fort batteries and everyone can tour the lighthouse. The windswept beaches are great for fort building with driftwood, kite flying, and beachcombing. Ebey’s Landing National Historic Reserve encompasses the town of Coupeville, and multiple acres in each direction, preserving the historical sites in the area. We love to head to Ebey’s Prairie, where the Ebey homestead and Fort Ebey are still evident. You can read about the founding Ebey family here. All sites are self-guided, which is nice for spontaneous visits. Why Stay at Staybridge Suites? When we plan a vacation that takes us outdoors and around town – location, space, easy parking and free breakfast top our list of must-haves when it comes to our hotel. As a family of five, we need as much room as we can get and plenty of food because it is always being consumed by our crew! We don’t necessarily need a pool or complimentary Wi-Fi, but those are sure nice, too. Staybridge Suites is part of the InterContinental Hotels Group family, which means we could use our earned points. Staybridge Suites Seattle North-Everett was especially clean, with friendly staff, great breakfast choices and in the perfect location. It put us close enough to the ferry that we could easily get to the island, but also very close to I-90, so we could hop in the car and be in Seattle in no time. As an added bonus, it’s always nice to have an indoor pool! 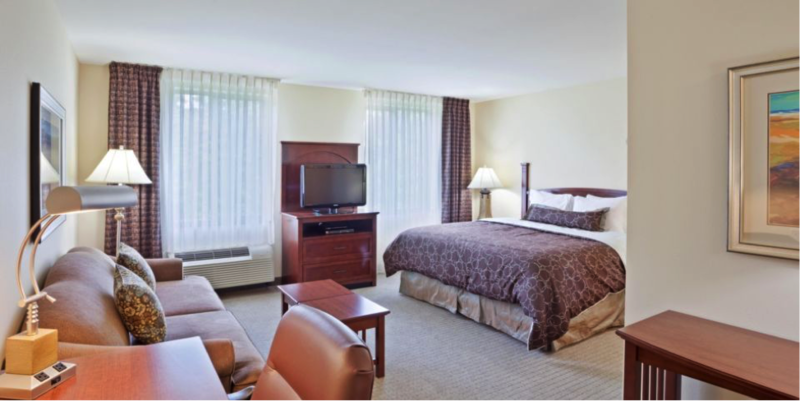 When your family is on their next getaway, check out Staybridge Suites for all the comforts of home while out of town.